The definition of a rectangle is often mis-stated. It is not “a shape with 2 long sides and 2 short sides.” It is a shape with 4 right angles in which opposite sides are equal. By this definition, 2nd graders should begin to understand that a square IS a rectangle with one added feature (all of the sides are equal). All squares are rectangles (because opposite sides are equal and all angles are 90°), but not all rectangles are squares. All squares are rhombi (because all sides are equal and there are 2 pair of parallel lines), but not all rhombi are squares. 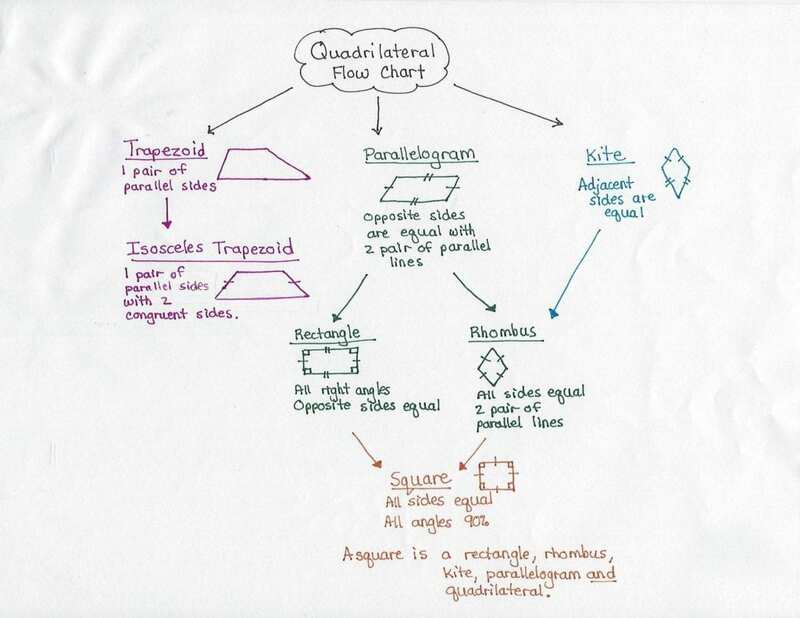 All squares are parallelograms (because opposite sides are equal with 2 pair of parallel lines), but not all parallelograms are squares. All rectangles are parallelograms (because opposite sides are equal with 2 pair of parallel lines), but not all parallelograms are rectangles. All rhombi are parallelograms (because opposites sides are equal with 2 pair of parallel lines), but not all parallelograms are rhombi. 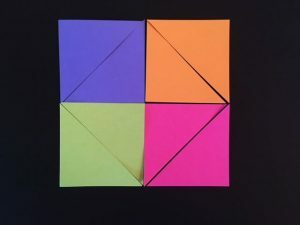 All rhombi are kites (because adjacent sides are equal), but not all kites are rhombi. *Adjacent means the sides share a common vertex. You can see that to recognize the attributes and adequately describe, compare, draw, or construct these shapes, students need to have a very good understanding of types of angles and parallel lines. A polygon is a closed 2D figures with straight sides. It includes all of the 2D shapes on the above guide (but does not include the circle – because it has curves). If the shape had curves or doesn’t fully connect, then it can’t be called a polygon. A regular polygon is one in which the sides are all the same length and whose angles are all the same. So any 8-sides polygon would be called an octagon, but a regular octagon would have 8 equal sides and angles. 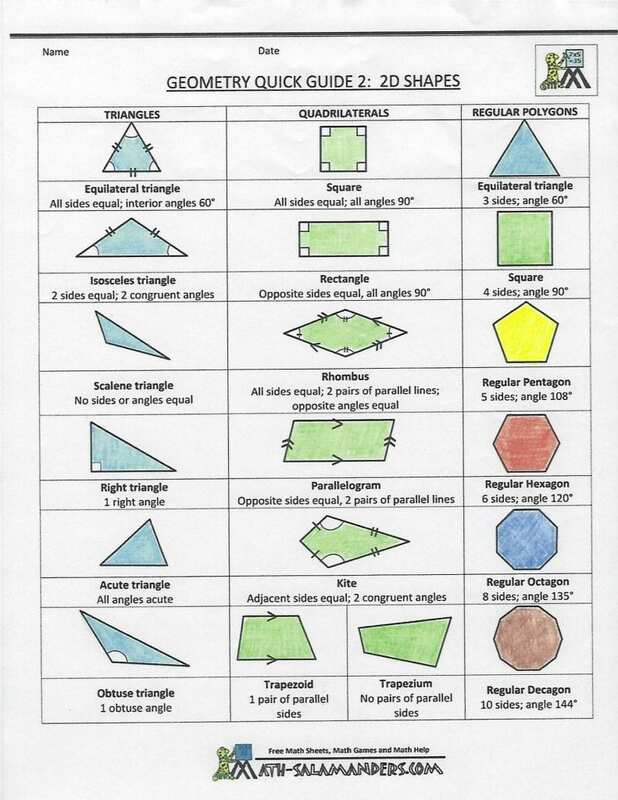 Check below for some FREE resources about identifying polygons. Polygon (yes or no) worksheet by Norma Saenz (FREE from TPT): Is it a polygon? Next week: I will go more in depth regarding some of the geometry standards above to provide hands-on ideas and help clear up student misconceptions. Enjoy!